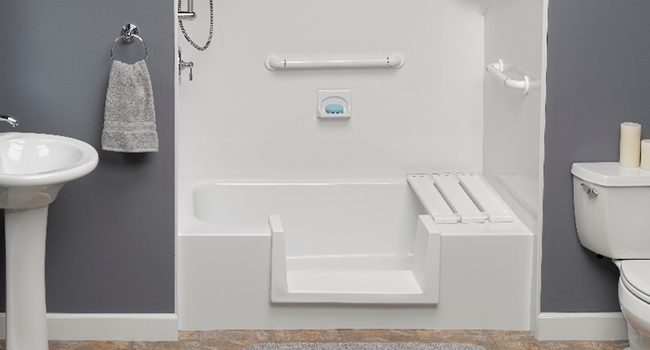 A new walk-in bathtub or shower is great for the whole family but is especially great for seniors or those who are disabled. It allows easy access to bathing. Some styles include soothing jets and contour seating. Others are more basic and are just like a standard bathtub but with a lower entry for safely walking into the bathtub. Your existing bathtub can likely be converted into a walk-in bathtub for a fraction of replacement cost. Choosing the right company to install or convert your existing bathtub into a walk-in tub can save you time, frustration and money. Choosing the wrong company can make your life miserable. Renew-It Refinishing offers three different types of Walk In Tubs. Basic, Deluxe and our Best Tub Refinishing. 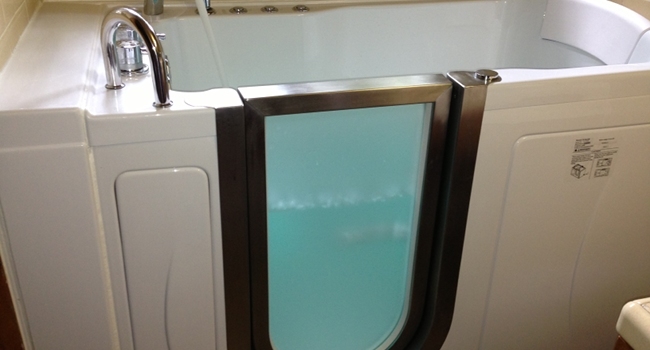 Our Basic Walk In Tub is actually a conversion of your existing tub into a walk in tub. We cut a small entrance in the front of the tub and insert our specially crafted walk in repair piece. 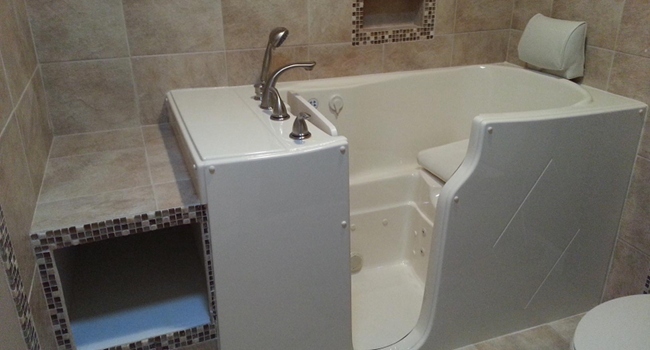 This creates a walk in tub for those on a budget or for those who aren't interested in replacing their entire bathtub. This can be completed in just one day. 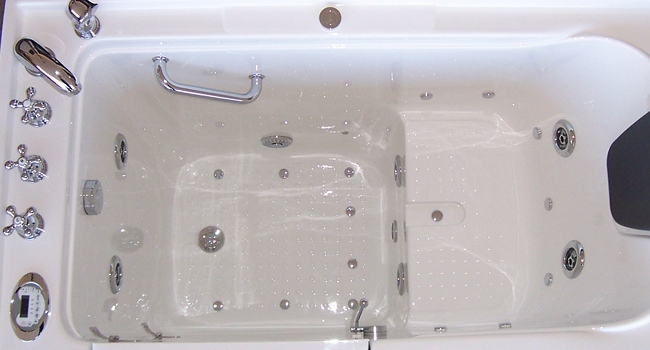 Our Deluxe Walk In Tub is a replacement for your existing bathtub. We remove the old bathtub and replace it with a new walk in shower. This usually takes two to three days and will give you a brand new walk in tub. This method does not allow for soaking as it is just a walk in shower. Our Best Walk In Tub is also a replacement for your existing bathtub. We remove the old bathtub and replace it with a new high style walk in tub. This walk in tub comes with a door that closes and a comfortable seat for deep soaking and relaxing without having to lay completely flat. An upgrade option includes jets for a relaxing water massage for a spa feel. Is a Walk In Tub Tax Deductible? The short answer is yes. If you have the right circumstances. If a walk in tub is purchased for medical safety reasons, it can be consider a medical expense and therefore under the materials and the installation costs are tax deductible as a Medical and Dental Expense. If one is caring for an elderly parent in their home and they make a home modification which includes the addition of a walk in tub, the homeowner can claim the expense under the Dependent Care Tax Credit. Some states have their own version of this credit; click here to learn more. Call us today to discuss this further. We can provide more details at your No Obligation Consultation. Why would install a walk in tub? There are so many reasons why a Walk-In Bathtub Conversion is a great idea. If you would like an easier, more pleasant bathing experience for yourself, or an aging or disabled loved one, this is the perfect place to start. You may have an aging or disabled loved one living in your home who desires the freedom to bath alone. You may be selling your home in an area with a large senior community and want your home to stand out above others as being "senior friendly". You may be remodeling your bathroom and want to use this opportunity to upgrade to a relaxing and soothing spa type bathtub, but have limited space that only a walk-in standard size bathtub will fit in. Whatever your reason for wanting to replace or convert your existing bathtub into a walk-in bathtub, Renew-It Refinishing can help. Contact Us here for a free, in-home consultation. No obligation and never any pressure to buy. How to choose the right walk in tub installation company? We certainly hope that you will choose Renew-It Refinishing for all of your home safety needs. But we realize that there are a few other walk-in bathtub installers in Portland and Vancouver and that you want to make sure that you are choosing the best one. So, here are a few tips. As with any service company, the longer an installer has been in business, the bigger his reputation with the local community. Either for the good or the bad. Reading Client Testimonials really helps when searching for a walk-in bathtub installer. Allow his clients to fill you in on their experience. Make sure whomever you choose has a great reputation. Also make sure that he is fully covered by insurance. There are some real horror stories of contractors who are not covered with the proper insurance causing big problems and leaving the homeowner with the bill because they were not properly covered. Bonding and licensing is also important. By the way, Renew-It Refinishing has all of this and more. Check out our great Guarantees here that no other walk-in bathtub installer in Portland or Vancouver is brave enough to put in writing. There are many different styles of walk-in bathtubs or showers to choose from. 1) The least expensive and fastest method is converting your existing porcelain or fiberglass bathtub into a walk-in tub. We methodically cut out the front of your tub and insert new walls and edges to make it look like a factory finish. 2) Another style involves removing your existing bathtub and installing a new, one piece, walk-in bathtub. 3) Another style involves removing your existing bathtub and installing a simple walk-in shower. This does not allow soaking, but is much safer for entering and exiting the bathing area. We use different methods depending on your needs. No matter which style you choose, Renew-It Refinishing ensures that you will be 100% satisfied with our work. We will work with your existing plumbing and made adjustments as necessary. We will ensure that your plumbing is tight and does not leak after installation of your new walk in tub. For our Basic Walk In Tub, we do not need to touch your plumbing pipes as we are simply adding a pass through in the front of the existing tub. Ask your sales representative during your No Obligation Consultation about the warranty on your choice of walk in tub.